Bargains hunters will be out in force next week, as Lloyds Auctioneers and Valuers sell millions of dollars worth of highly sought-after and heavily discounted agriculture equipment from one of Australia’s largest farms, west of Goondiwindi. With this huge clearance sale taking place in Western Queensland on 21st March, here are our Top 3 Tips for snapping up bargain-priced farming assets at a clearance sale auction. Viewing the items you’re interested in online is a great start, but nothing beats inspecting used farming equipment in person before auction day. There can be fierce bidding competition, and you‘ll be ahead of the crowd if you know exactly what you’re looking at. Walking around equipment and checking out items of interest in the flesh means you can view service or log books, ask the auctioneer questions and find out how much interest there may be in a particular item. Assets on offer in this upcoming auction are from a property that has been farmed for more than six generations and is one of Australia’s largest agricultural producers, with quality equipment to match that sort of operation. Stand out items going under the hammer on March 21 include a brand new Caterpillar excavator, several John Deer tractors and harvesters, ploughs and Kenworth prime movers. All have full service histories too. But it’s not just the large farm assets that are sought after at these types of auctions, there are plenty of smaller items that will go for a steal, including shipping containers, excavator buckets, steel pipe and thousand-litre containers. Viewing the items for sale before auction day is one of the best ways to do your research prior to auction day, but you should also do a little research on the item’s second-hand value. If you’re in the market for a major piece of farming equipment, familiarise yourself with real market values and what it’s worth to you. You’re always sure to snap up an item at well under its value at auction, and this is true of farm clearances too. Bidding online early is a great way to get a feel for the bidding process and familarise yourself with the way an online auction website works. Lloyds Auctioneers and Valuers offers a user-friendly online platform to bidders, allowing people to bid from afar without the need to travel. 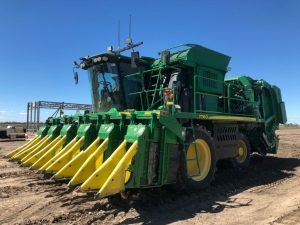 Equipment in this auction is located 35 kilometers west of Goondiwindi, however distance and location are not a barrier when taking advantage of online bidding for the sale of this farming gear. Inspections are welcome – viewing is open to the public 8am to 5pm daily at the property, Barwon Highway, State Route 85, Toobeah. (Approximately 35km west of Goondiwindi).